Nearly every man would love to have the ultimate garage. 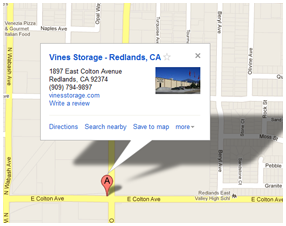 Redlands CA storage facility, Vines Storage, understands that most men love their vehicles. Whether they have invested in a new car or have numerous classic cars that they enjoy restoring, many men will agree that cars are their passion. However, not everyone has the ultimate garage to store his or her collection of precious vehicles, but Vines Storage has the solution! Vines Storage offers indoor and outdoor car storage for those who want to find a home for their extra vehicles. Whether you have several cars that need to be fixed up, or have a few classic cars that you enjoy taking for a road trip every now and then, it is nice to know that while they're not in use, they are protected from the elements and in the care of a capable facility. Vines Storage is a self-storage facility in Redlands CA that allows individuals to store almost anything, including cars, boats, and RVs. Who can benefit from car storage? Anyone who needs the space on their own property may enjoy having a few of their cars stored off-site. Classic cars need to be protected to stay looking great, and so indoor car storage is a great way to eliminate problems associated with storing cars out in the elements. Paint can chip and fade, the sun can damage and dry exterior elements, and hail can cause unsightly dents and pits in an otherwise amazing classic car. Many are worried about their car being stolen, vandalized, or broken into, so self-storage for the vehicles that are not used every day is a smart consideration. Having these vehicles out of sight can help keep intruders from becoming interested in targeting your home for theft or robbery, as some thieves look at the ownership of classic cars as a sign of wealth. Don't let your home be a target--have your classic cars stored off-site instead! Vines Storage has a variety of self-storage options to help with all your storage needs. Whether you need to store furnishings, cars, boats, or other personal belongings, we have a variety of unit sizes and options available for everyone, including flexible payment options and month-to-month storage considerations. Call today to learn more about our facility and our storage options!